After receiving his Ph.D. in Sociology from the University of California, Berkeley in 1958, Amitai Etzioni served as a Professor of Sociology at Columbia University for 20 years; part of that time as the Chairman of the department. He was a guest scholar at the Brookings Institution in 1978 before serving as a Senior Advisor to the White House on domestic affairs from 1979-1980. In 1980, Etzioni was named the first University Professor at The George Washington University, where he is the Director of the Institute for Communitarian Policy Studies. From 1987-1989, he served as the Thomas Henry Carroll Ford Foundation Professor at the Harvard Business School. 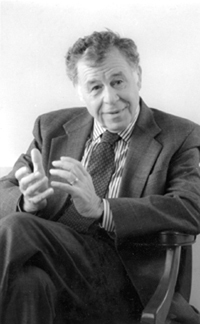 Etzioni served as the president of the American Sociological Association in 1994-95, and in 1989-90 was the founding president of the international Society for the Advancement of Socio-Economics. In 1990, he founded the Communitarian Network, a not-for-profit, non-partisan organization dedicated to shoring up the moral, social and political foundations of society. He was the editor of The Responsive Community: Rights and Responsibilities, the organization’s quarterly journal, from 1991-2004. In 1991, the press began referring to Etzioni as the “guru” of the communitarian movement. Etzioni is the author of twenty-four books, including From Empire to Community: A New Approach to International Relations.